Acura is recalling more than 323,000 examples of the MDX crossover in the US because the brake lights in the rear liftgate can potentially fail. 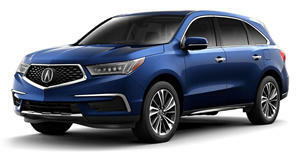 The recall affects MDX crossovers manufactured for the 2014-2019 model years, according to a statement released by the manufacturer. According to Acura, seals around the rear liftgate light may deform, allowing water to leak into the light assemblies. Should this happen, water could reach some electrical and cause the tailgate lid light to fail, and, in some cases, a short circuit that trips the position light fuse, deactivating the exterior position lights and some interior lighting. As a result, this could obviously make the vehicle less visible to other traffic at night, increasing the risk of a crash. Luckily, Acura says it hasn’t received any reports of accidents or injuries related to this issue. To fix the issue, Acura dealers will replace the gasket seals in both rear tailgate lid lights with updated parts. If a light is found to be inoperable due to moisture intrusion, the lid light assembly will be replaced along with associated wiring sub-harness if required. As with all manufacturer recalls, repairs will be carried out free of charge. Affected MDX owners will be notified by mail in early May to arrange an appointment with their local dealership to get the faulty parts replaced if necessary. Last month, the Acura MDX crossover from the 2003 to 2006 model years was also recalled as part of a wider campaign affecting one million Honda vehicles in the US and Canada due to defective Takata airbag inflators that have claimed the lives of at least 23 people worldwide and injuring hundreds more.